Buying fresh herbs can get expensive rather quickly, but when it comes to freshness of flavor, there really is no compromise. Growing your own herbs is a great way to maximize savings, but if you lack a green thumb (or don’t lack overzealous cats), getting the little sproutlings to grow up nice and tasty can be a difficulty. Any way you harvest your herbs (at the store or in the garden), you are going to need a way to store them. 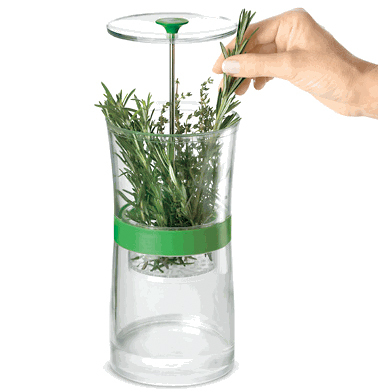 The Cuisipro Herb Keeper helps to prevent premature herb loss by creating an environment conducive to their longevity. By standing herbs upright on a suspended tray, the herb storage solution allows the ends to soak in water, which helps them to keep fresh longer. The herb tray measures 8.5-inches tall with a diameter of 4.75-inches, and stores neatly in the refrigerator door, and looks much nicer than a soggy, rolled-up paper towel that might contain herbs.